Today’s global economic landscape is changing rapidly. Regions around the world are becoming more globally interconnected and global economic growth is shifting from the Western world to the fast-rising Asia Pacific Region. 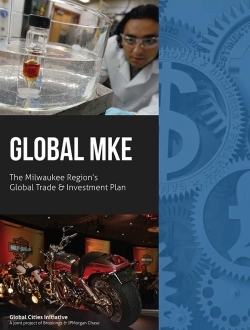 The Milwaukee Region’s economic future depends on a focused and aggressive global trade and investment agenda that better positions the region’s firms to compete in world markets. Realizing this economic imperative, the region’s economic development community has engaged cross-sector leadership from government, business and industry associations to champion new directions in international business development through the Global MKE Trade and Investment Plan. The plan combines export and foreign direct investment strategies into a single, highly coordinated plan with a common goal and objectives to strengthen the region’s global connections and support sustainable economic growth.